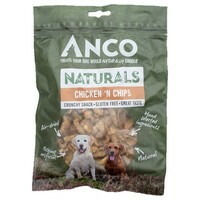 Anco Naturals Chicken 'N Chips are delicious crunchy snacks with a great taste made from 100% Chicken. Each treat has been gently air dried to preserve as much of their natural goodness as possible. Hand selected to ensure that each pack of Chicken 'N Chips is of the highest quality, Anco Naturals contain nothing artificial, and are rich in vitamins, minerals and nutrients. The quality is horrific. Once I opened the packed there was a smell of plastic and something rotten. There is no way I would be giving this stuff to my dog. P.S. Checked the use by date and everything was fine with it, so there is no explanation to that funny smell.